When St. Cloud State went through its reorganization in 2010-11, President Potter said that an important focus of the school would be on STEM-related programs. To those who knew about the University’s rejecting Fedex’s offer of donating a cargo jet, President Potter’s statement about STEM being a priority rang hollow. 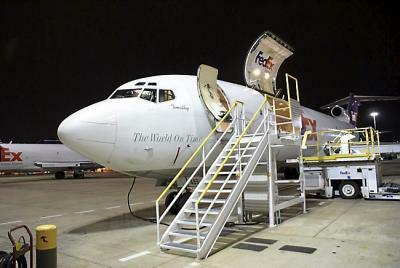 FedEx is donating a 20-year-old cargo jet to serve as a classroom in St. Paul. The 153-foot-long Boeing 727-200F named Timothy will permanantly cool its jets at the St. Paul Downtown Airport’s Holman Field. A ribbon-cutting ceremony will be held at 10 a.m. Tuesday at the airport after the plane lands. Previously used to deliver FedEx packages nationwide, the aircraft will soon be used as a stationary classroom for aviation students at St. Paul’s Farnsworth Aerospace Magnet School. “Instead of scrapping or selling these jets, we decided to donate them to help the next generation of pilots and aircraft technicians,” said Jim McCluskey, FedEx spokesman. The jet will be donated to the Minnesota Association of Women in Aviation. Through a $100,000 federal grant, the Learning Jet classroom will be made available for other schools as well. “I think it’s important to students all over Minnesota because groups can use the space for real-world experience,” said Jill Wall, program manager at Farnsworth Aerospace. The jet’s classroom renovations will be finished in the fall. The school is planning to use the space for courses in science, technology, engineering and math. Within that curriculum, students will learn about transportation in aviation, railroads, highways and waterways. The engine on the jet will be removed, but school officials are considering including the parts in the curriculum. The inside will have rows of desks on either side of the aircraft. In the back will be four simulator stations where students can learn to drive vehicles, fly aircraft and command boats. The Farnsworth Magnet School leadership understood how important this jet would be to their STEM projects. That’s something that President Potter either didn’t understand or didn’t put a high priority on. Finally, the jet FedEx wanted to donate to SCSU would’ve been stored free of charge at the St. Cloud Regional Airport. FedEx had already promised to fly the plane their on their dime. The only cost of bringing the jet in was in permanently mooring the airplane. It was speculated at the time that the St. Cloud City Council would’ve paid for that because the bill was expected to be approximately $2,000. In short, it a) wouldn’t have cost SCSU a penny and b) would’ve been a great learning tool for students from grade school through college. In short, President Potter blew another decision that would’ve positively impacted SCSU and the greater St. Cloud community. Earlier in the show, Jay Kohls said that e-tab revenue through June was $2.4 million, far short of the $35,000,000 that’s needed for the state portion of the $975,000,000 stadium cost. According to Kohls’ report, the state gambling board was hoping to have 2,800 establishments selling e-tabs. At the end of June, 300 establishments were selling the e-tabs. Entenza is tapdancing. He should be ashamed of himself for that spin. Other cities and other states have built stadiums for their teams. I’ve watched them built in Pittsburgh, Atlanta, Dallas, San Francisco, New York City and St. Louis in addition to the Metrodome and Target Field. This is the only stadium funding mechanism that’s been this woefully short. In fact, it’s the only funding mechanism that didn’t come off without a hitch. Gov. Dayton pushed the Vikings stadium so hard that he didn’t care whether the funding mechanism worked. He worried more about schmoozing NFL Commissioner Roger Goodell than he worried about the funding mechanism. Friday night, Michele Kelm-Helgen of the MSFA admitted that e-tab revenues likely will never produce the revenue required to pay off the stadium bonds. Then she admitted that the DFL legislature passed a tax increase by closing an income tax ‘loophole’ which is projected to generate $20,000,000 a year. That’s right. She admitted that Gov. Dayton broke his promise that the state general fund wouldn’t be used to pay for the stadium. Gov. Dayton was foolish enough to buy the state gambling board’s revenue projections. Thanks to his pushing this project, Minnesota taxpayers will be paying for Zygi’s palace. While pushing the Vikings stadium, Gov. Dayton said he wanted the new stadium to be known as “the People’s Stadium.” Thanks to Dayton’s funding mechanism, it’ll be the people’s stadium because they’ll be paying for it through higher taxes for the next 30 years. Stadium financing isn’t complicated. It’s just that it was too complicated for Gov. Dayton. CP: a bigger, faster Harvin? Two days into his first NFL training camp, Patterson has impressed the staff with his ability to retain information and execute pro plays despite his only having one year of Division I college experience. This isn’t to say CP is Percy Harvin’s equal. That’d be foolish considering the impact Harvin made while inspired. Apparently, there are some striking similarities between Harvin and CP. Both are dynamic from multiple formations and positions. Both are fast. What’s most impressive about CP is that he’s apparently a fast learner. When Harvin was drafted, then-Vikings coach Brad Childress threw the playbook at Harvin. Coaches were impressed with Harvin’s ability to learn multiple positions quickly. Based on Brian Murphy’s Pi-Press article, it sounds like CP is a fast study, too. That isn’t the label he had heading into the draft. If I had a $10 bill for each newspaper article or TV segment that characterized CP as “raw”, I’d be rich. Harvin was traded to Seattle for Seattle’s first round and seventh round picks in last April’s draft and Seattle’s third rounder in next year’s draft. The Vikings turned Seattle’s first rounder into FSU cornerback Xavier Rhodes, a 6’2″ athlete with a 4.4 time in the forty. Meanwhile, Seattle put Harvin on the PUP (Physically Unable to Perform) list. If Harvin’s hip needs surjery, his season is likely over. Most experts, including ESPN’s Bill Polian, Mark Schlereth and Tedy Bruschi, said the Vikings got the better of the trade long-term, with Seattle winning in the short-term. If Harvin doesn’t play this year, the Vikings will likely win the trade outright. Frazier said Patterson will get every chance to secure the kickoff return job. Unlike Percy Harvin, whose electrifying returns and the pounding he took on kickoffs sometimes kept him on the sideline during offensive possessions, Patterson’s size (6 feet 2, 220 pounds) should allow him to work double shifts. CP is the type of dynamic playmaker that frightens defensive coordinators. His running skills are elite level. In fact, Polian said he didn’t consider CP a wideout, that he thought of CP as a running back. Watching some of his highlight videos, I’d wholeheartedly agree with Polian’s run-after-the-catch opinion. Being 6’2″ and 220 pounds and able to run a 4.4 forty is something that must be accounted for by defenses, too. If CP learns the Vikings playbook quickly, as Brian Murphy’s article suggests, the Vikings offense could be frightening. The Vikings offensive line is solid, with Matt Kalil anchoring the unit. GM Greg Spielman added Greg Jennings and CP to a depleted receiving corps. Kyle Rudolph was last winter’s Pro Bowl MVP. And of course, the offense is built around Adrian Peterson, the seemingly bionic running back. If Christian Ponder continues to improve, the Vikings will challenge the Packers for the NFC North championship. This afternoon, a Democratic strategist was interviewed by Eric Bolling about the pension/bailout situation in Detroit. Showing the intellectual heft of a child going through terrible twos, this strategist asked if anyone would willingly sit across from a retired union worker and tell them “they won’t get their $18,000 a year pension that they paid into”? Here’s the short answer. I’d volunteer for that responsibility. While attempting to keep Michigan in the Democrats’ electoral column for 2016, which seems likely, this strategist is portraying this public employee union as a victim. That’s plain wrong. These PEUs campaigned for fiscally irresponsible politicians who promised the PEUs a goose that would continue laying golden eggs forever. The PEUs bought the politicians’ BS and voted for fiscal irresponsibility. They wanted it. They got it. Now it’s time for them to deal with it. Let’s put it differently. These PEUs made their bed. Now it’s time for them to sleep in it. Next time, don’t vote for fiscally irresponsible politicians. This strategist apparently thinks that unions that make fiscally foolish choices should be spared the consequences of their foolish decisions. That’s rewarding foolish behavior, which is a shortcut to more foolish behavior. Finally, this strategist’s argument was disgusting. In terms of intellectual heft, it was the adult equivalent of a spoiled brat’s temper tantrum. There wasn’t anything adult about it. It intentionally played to people’s emotions. While that’s effective in certain situations, it isn’t a sign of intellectual heft. Frankly, these PEUs and this Democratic strategist needs a timeout, followed by an extended period of adult supervision. medical and scientific equipment like microscopes, x-ray machines, etc. The DFL’s tax increases hit every income group in the state. Everyone will get hit with the DFL’s tax increases. What’s worst is that the DFL’s tax increase is paying off the DFL’s special interest allies while giving the average Minnesotan less effective government, especially less effective schools. Think about this: the DFL raised taxes on everyone while repealing the Basic Skills Test for teachers. That isn’t just a bad deal for Minnesotans financially. It’s a terrible shafting of students who need high quality teachers so they can compete with people in other states and around the world. What’s pathetic is that Gov. Dayton signed the DFL middle class tax increase into law at the same time he signed the repeal of the Basic Skills Test. What’s most pathetic is that Gov. Dayton signed the DFL middle class tax increase into law at the same time he signed the repeal of the Basic Skills Test requirement that he’d signed into law in 2011. Does Gov. Dayton do whatever the DFL’s special interest supporters tell him to do? That’s what it looks like. There certainly isn’t proof that he’s ever stood up to the DFL’s special interest supporters. We certainly don’t need a governor who resembles a potted plant. We need a governor who thinks things through and acts in the best interest of all Minnesotans, not just the DFL’s special interest supporters. Finally, St. Cloud needs a legislator who’s willing to tell his party’s leadership he won’t vote for legislation that hurts middle class families. St. Cloud needs a legislator who doesn’t vote according to the DFL’s special interest supporters’ wishes. Minnesota schools will be receiving $463 million in repayments due to the budget we passed earlier this year, which accelerated the school shift payback. The previous legislature borrowed over a billion dollars from schools to patch up the budget deficit during the 2011-2012 session. Minnesota Management and Budget recently announced that the state has $463 million in unaccounted revenue collected during the past budget cycle. This means that Minnesota’s economy is recovering faster than expected, and it also means that our schools will be getting a huge repayment. Due to the accelerated repayment plan, all of that money will go directly to Minnesota schools, and they should be fully repaid by 2014. First, saying that there’s an accelerated payment plan is BS. The GOP budget produced a significant surplus. That’s why saying that “the state has $463 million in unaccounted revenue” is a tortured explanation for what actually happened. Next, it’s offensive to hear the DFL taking credit for repaying the school shift. In 2012, the GOP legislature passed a bill that would’ve paid off a huge portion of the school shift. The DFL voted against that repayment, then Gov. Dayton vetoed the bill. Fast foward to this year’s budget. That isn’t likely because he was silent when Gov. Dayton unveiled his Mulligan Budget. Both of Gov. Dayton’s proposed budgets called for paying off the school shift in 2017. The repayment plan didn’t become popular until Speaker Thissen tied it to an income tax surcharge. Third, predictions that the school shifts will be paid off “by 2014” don’t take into account the uncertainty of whether the DFL budget will work. With companies leaving Minnesota, there’s no guarantee the DFL’s budget will produce a surplus. Meanwhile, we know that the GOP budget worked because it left a surplus of $463 million. In addition to paying back our schools, we passed several new measures and reforms to improve education from early childhood through college and ensure that our state is economically competitive for years to come. The biggest ‘reform’ that the DFL passed is repealing the Basic Skills Test requirement that the GOP legislature passed and Gov. Dayton signed in 2011. Repealing that law undercuts everything. Without qualified teachers in the classrooms, all the other EdMinn/DFL talking points mean nothing. Protecting teachers that failed the Basic Skills Test isn’t reform. It’s a payoff to a DFL special interest supporter. The DFL didn’t hesitate in repaying AFSCME with childcare unionization legislation. Why wouldn’t the DFL pay off EdMinn for their past support by gutting teacher quality? The DFL says that they’re doing this for the kids. That’s BS. They did it to keep EdMinn members making campaign contributions. Rep. Dorholt also talked about who’s getting hit with the sales tax increase. It’s actually quite informative but it’s too long for this post. Check back later this morning for that post. Former WCCO news anchor Don Shelby is reportedly mulling a run against three-term Republican Rep. Erik Paulsen next year, potentially putting in play a suburban Minneapolis congressional district that has been in Republican hands for decades. Shelby’s interest burst into the open amid remarks by U.S. Rep. Collin Peterson, D-Minn., who mentioned it at a Washington fundraiser Wednesday attended by about 30 or 40 campaign contributors, lobbyists and Democratic activists. Peterson’s account of Shelby’s interest was confirmed by two prominent Minnesota lobbyists who were at the luncheon. Both said Peterson described Shelby’s long career in Minnesota broadcast journalism. Democrats have been tight-lipped about Shelby’s possible entry into the race, but they made clear Thursday that they would welcome a respected Twin Cities figure with almost universal name recognition across the state. I think Martin is spinning this. In his 2008 election, his first run for office, Paulsen won by 8 points. In 2010, Paulsen won re-election by 22 points. In 2012, he won by 16 points. If Chairman Martin thinks that sounds like a swing district, then he’s delusional. I think it’s that he’s just blowing smoke to ramp up fundraising. Certainly, Shelby has great name recognition throughout Minnesota. Still, he’s a liberal challenging a popular incumbent. That’s a different dynamic than last year’s Bachmann vs. Graves race. None of Michele’s races were easy. Compare that with Paulsen’s margins of victory. At the end of the day, a Paulsen-Shelby matchup would generate lots of publicity in the papers but Paulsen would still win by 8-10 points.